The Federal High Court in Abuja has frozen seven separate accounts which, according to the EFCC, were used by the Nigerian Governors’ Forum to launder the sum of N10bn said to be derived from the proceeds of the Paris Club refund. Justice Gabriel Kolawole directed on Wednesday that the freezing order would last for 45 days within which the EFCC must either institute charges in respect of the transactions against the relevant suspects or apply to the court for an extension of the order. EFCC’s lawyer, Mr. Ben Ikani, had moved the ex parte application seeking the freezing of the accounts on November 27, following which Justice Kolawole adjourned till Wednesday for ruling. 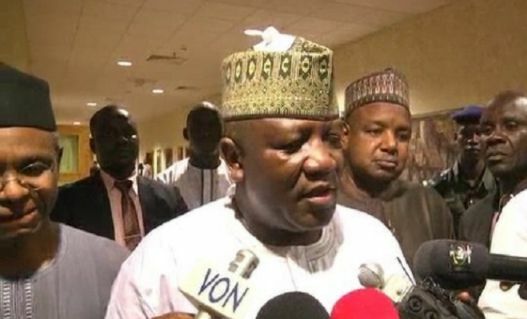 The commission alleged that its preliminary investigation had revealed that the N10bn was fraudulently diverted by the NGF under the guise of paying consultancy fee to BizPlus GSCL Consortium which the Forum engaged “to carry out reconciliation of accounts and recover the amounts due to the states” from the refund of the over-deducted payment of Paris Club debt by the Federal Government from 1995 to 2002. In an affidavit filed in support of the EFCC’s ex parte motion, a member of the Special Investigation Committee, set up by the commission to investigate the alleged Paris Club refunds scam, Osas Azonabor, alleged that preliminary investigation had revealed that the NGF caused the Central Bank of Nigeria to pay N19,439,225,871.11 into its account for onward payment to BizPlus as consultancy fee. But the investigator stated that N10bn of the N19.4bn paid to the NGF account by the CBN was fraudulently disbursed to the seven accounts of companies and individuals, who were not part of the said BizPlus GSCL Consortium. Detailing how the fraud was allegedly perpetrated, Azonabor alleged that the NGF had agreed to pay success fee of two per cent to BizPlus GSCL Consortium. But the investigator alleged that upon the success of the recovery, rather than stick to the two per cent fee, the NGF caused the Central Bank of Nigeria to deduct five per cent, amounting to the N19.4bn. He said, “That sometime in January 2017, the applicant (EFCC) received intelligence in respect of a case against the Nigerian Governors’ Forum alleging conspiracy, criminal misappropriation of public funds involving the sum of N19,439,225,871.11 out of the Paris Club refund made by the Federal Government in favour of the 36 states of the federation. “That preliminary investigation conducted by the commission revealed that the 36 state governments, under the auspices of the NGF, engaged the services of Bizplus GSCL Consortium to carry out reconciliation of accounts and recover amounts due to the states from line charge made on them from 1995 to 2002 for a success fee of two per cent payable by the NGF. “That investigation further revealed that contrary to the agreed fee of two per cent as stated in paragraph 6 above, NGF caused the Central Bank of Nigeria to deduct five per cent of the amount due to the states which amounted to the sum of N19.4bn (stated in paragraph 5 above) and paid the same into the NGF account, supposedly for onward payment to the Bizplus GSCL consortium. “That our investigation of the case further revealed that a larger part of the amount stated in paragraphs 5 and 7 above was fraudulently disbursed by the NGF to individuals and corporate entities that were not part of the consortium. “That the names, account numbers and bankers of the fraudulent beneficiaries of the criminal diversion of the public funds are as stated in the schedule to this application and that copies of the statements of accounts showing the disbursements is hereby attached and marked Exhibits EFCC1, 2, 3, 4, 5, 6 & 7 respectively. Justifying the commission’s request for the freezing order, Azonabor stated that the 72 hours stop-order allowed by law to be placed on any account suspected to be involved in suspicious transaction or any crime had expired, but investigation had yet to be concluded. He maintained that the court order freezing the accounts was needed to enable the EFCC to carry out its investigation to a logical conclusion. He said, “That further to the foregoing, I am aware that substantial amounts from the fraudulent disbursements into these accounts have further been laundered to some other accounts or withdrawn as cash. While discrete investigation is currently ongoing, the 72 hours stop order allowed by law to be placed on any account suspected to be involved in suspicious transaction or any crime has expired."